55 cards. Click here for a detailed guide and side-by-side comparisons. The world of sports is filled with legends. Legendary players, legendary moments, legendary achievements -- they're what make things compelling and keep us interested. 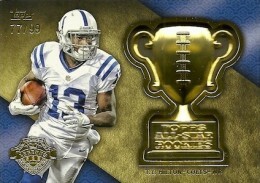 2013 Topps Football takes the theme of legendary and runs with it over the course of several inserts and promotions. 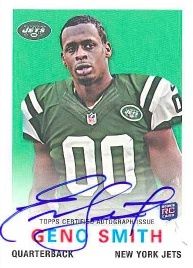 Staying consistent with recent flagship configurations, 2013 Topps Football hobby boxes have one autograph or relic card. Jumbo boxes have two autographs and a Rookie Patch card. 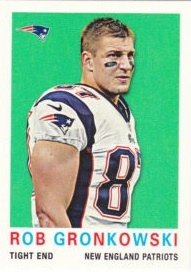 The 2013 Topps Football base set has 440 total cards. Veterans cover more than half of the checklist with 265 cards. Rookie are plentiful, with 110 first-year players making the list as well as a group shot taken at the 2013 NFLPA Rookie Premiere. 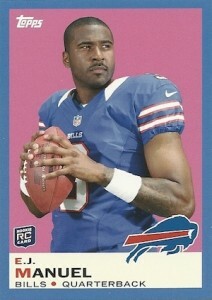 Collectors are guaranteed to find at least one rookie card in every hobby pack. 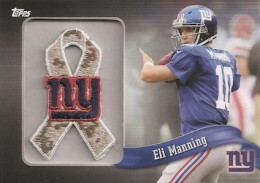 Other subsets include team cards, award winners and a commemorative Super Bowl card. 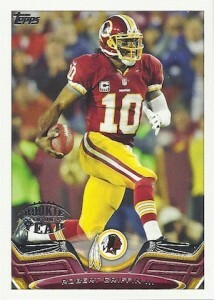 Select veterans and rookies also have short-print variations. Veteran photo variations highlight big plays, games and milestones. All base cards have six parallels: Gold (#/2013), Pink BCA (#/399), Military Camo (#/399), Black (#/58), Printing Plates and Platinum (1/1). 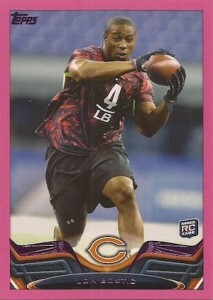 Rookies also have their own Build Your Own Legacy parallel that is numbered to 99. Topps is giving collectors incentive to chase the rookie parallel set by offering up prizes to those who net all 110 cards. The top prize is a trip to the 2014 Rookie Premiere. A trio of basic insert sets focus on past, present and, potentially, future legends. Gridiron Legends (1:6 packs) is all Hall of Famers. 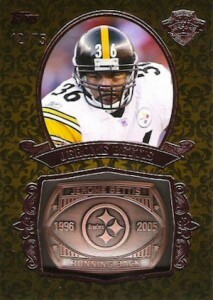 Legends in the Making (1:6 packs) looks at current players on pace to one day be enshrined in Canton. 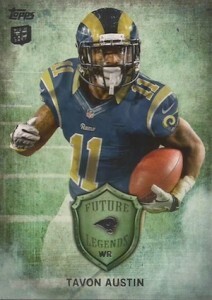 Future Legends (1:4 packs) spotlight rookies and young players. 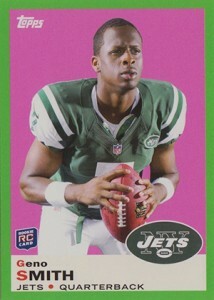 Some familiar names round out the 2013 Topps Football basic insert lineup. 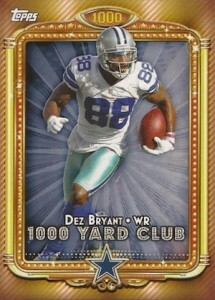 1,000-Yard Club (1:4 packs), one of the original flagship inserts, highlight running backs and wide receivers who hit the millennial milestone in 2012. 4,000-Yard Club (1:6 packs) is a quarterback-only insert reserved for those who threw for 4,000 yards last season. 1959 Topps Minis (1:3 packs) brings back the 53-year-old design in a slightly smaller format. Topps Autographs and Topps Relics give collectors a straightforward chase for signatures and game-used memorabilia swatches. 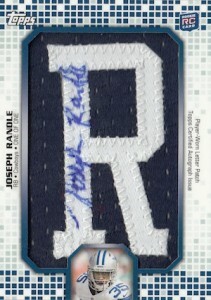 There are also Jumbo Relics (#/20), Autographed Relics (#/50) and Autograph Patch (#/50) cards. 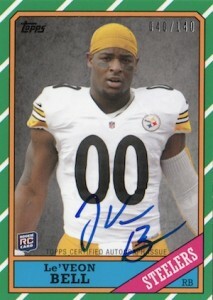 As well, select veteran and rookie base cards and variations have autographed versions. Truly Legendary Autographs include signatures from some of football's greatest players. Barry Sanders and Joe Montana are among those signing for the set. Silver Foil, Rainbow Foil and Gold Foil versions are all numbered to 50 or less. In the Name Relics use letters taken from a veteran's game-used jersey. 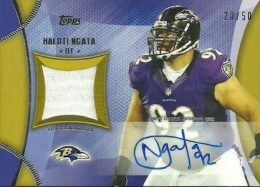 In the Name Autograph Relics take letters from jerseys worn the the NFLPA Rookie Premiere. Each of the one-of-ones is signed as well. 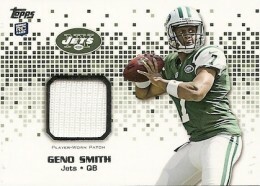 Rookie Patch cards fall one per jumbo hobby box. 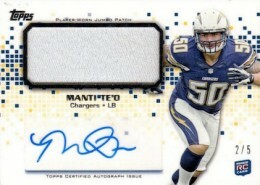 Rookie Autograph Patch and Rookie Autograph Jumbo Patch cards are exclusive to hobby packs. Rookie Premiere Autographs return. Basic versions are numbered to 90 while Red Ink cards are limited to 10. Multiple signatures are captured on Rookie Premiere Dual Autographs (#/25, Red Ink #/5) and Rookie Premiere Quad Autographs (#/10). 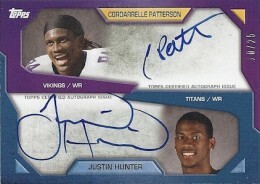 Five Ultimate Rookie Autographs use several panels to include signatures from all of the Rookie Premiere participants. 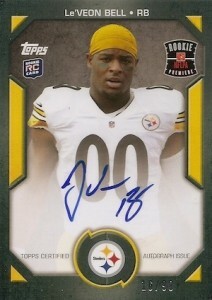 New to 2013 Topps Football are NFLPA Rookie Premiere Autographed VIP Pass cards. 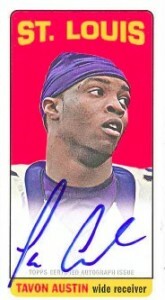 The replica passes have a head-shot of the featured player and an on-card autograph. Three designs from the past return for new autographs highlighting the 2013 rookie class: 1986 (#/200), 1965 minis (#/150) and 1959 (#/150). 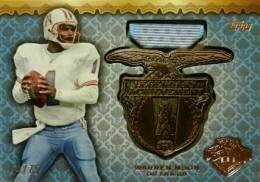 Manufactured relics for 2013 Topps Football once again use various metals. Legendary Achievement Medals have a military style to showcase 30 all-time greats. Gridiron Legends Busts have 30 players depicted with sculpted takes of their faces. Gridiron Legends Rings chart the careers of 30 greats. Legendary Club uses double-sided coins to honour quarterbacks, running backs and wide receivers who have reached the 1,000- or 4,000-yard plateaus on multiple occasions. All four of these relic sets have Bronze (#/75), Silver (#/50) and Gold (#/25) versions. All-Star Rookies and All-Pro Team honor the best players of 2012 with manufactured trophies. Continuing with the manufactured relics are Legendary Moments. 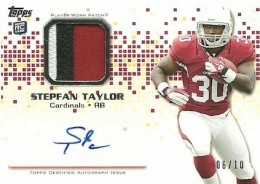 Numbered to 99, the cards capture a big play or achievement with a replica filmstrip. 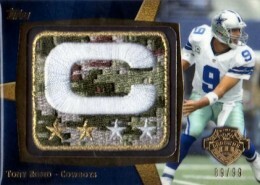 Legendary Captain's Patches (#/99) have a commemorative patch. 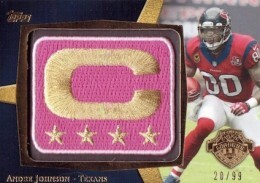 NFL Captain's Patch cards use replica patches to highlight key players on every team. 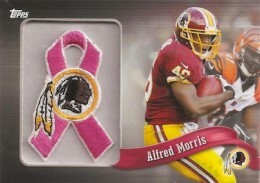 Military and Pink BCA versions are both numbered to 99. Good: Affordable for young collectors and budget collectors. Great entry-level base set. Lots of inserts and parallels. Bad: Only one hit per box. Questionable quality control. 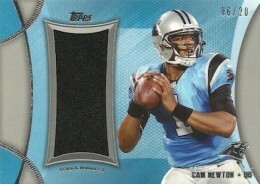 The Bottom Line: Topps has put together a decent low-end product that is nice for set collectors and casual fans. The boxes are loaded with a wide variety of parallels, variations and inserts, so the full collecting experience is there without having to break the bank. 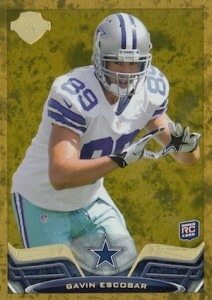 The Topps Football design is similar to past years with a white border and a design around the team logo and player name. There are some nice action shots in the product as well. 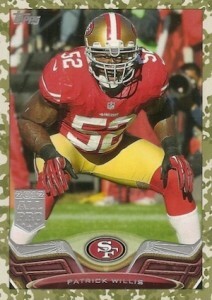 Topps also stuck with the standard gold, black and camo parallels of the base cards this year. While these are nice, I would like to see them come up with something a little more innovative, like these were when they first started with them. 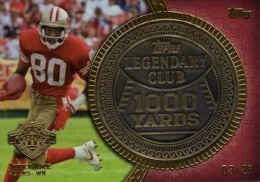 I kind of like the 1000-Yard Club and 4000-Yard Club cards. They have a sort of Broadway-feel to them, and it is good to see Topps branch out with something a little different. The minis are nice, but they too I think are getting to be an old concept. I also like that they have both current and retired players on the 1959 replica mini cards. 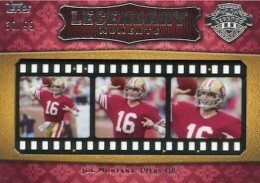 Topps did a nice job with their "Legends" concept this year as well. Featuring retired players, Gridiron Legends have a classic feel to them. Legends in the Making include a color variation based off the team colors and features current star players. Also, Future Legends evoke the feel of Inception with a cloudy background and feature up-and-coming players and rookies. 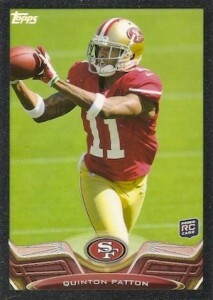 The jersey card we pulled seemed almost like they tried too hard and over-designed the card. It looked really busy on the front, and I think they could have made it better with a more simple approach and less conflicting curved lines on the front. Despite a good overall design, there appears to be some printing problems. It looks like a lot of the cards have corner issues. I have read that this is a problem with many boxes that people have busted. Also, the names of the players on the base card are hard to read, and on many of the cards, the silver finish on the Topps logo is wearing off. The checklist in Topps this year is inclusive. 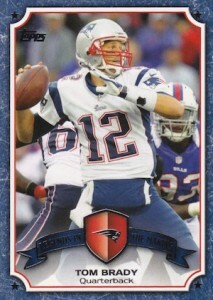 It includes a huge amount of players in the base and parallel sets. Rookies, veterans and retired players are all well-reflected in this deep product. This is also a top place to find less-heralded rookies and many of the unsung position players in the NFL. If you are solely looking for resale value, this product is not going to be a great option. Although there is potential for a big hit, most of what you will pull will be low-end cards, and you will not come close to getting your money back. 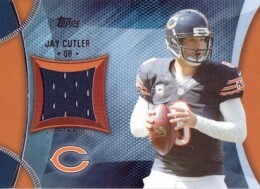 With that said, the true value here is for set collectors, player collectors, and team collectors. With the wide range of rookie, veteran and retired players that are available in this product, and the vast range of parallels that are available, there is plenty to collect. Topps is always a fun product to open. Going into this knowing the odds are against you for something high end, there is also the knowledge that you will get some pretty cool variations of the base cards and a lot of inserts. As a team collector, I love a product that offers me base cards and parallels of guys that are not widely available in other products. I can fill out a full team set, and trade many of my duplicates for parallels and inserts of my team from the master set. This product always provides some fun busting. I give the set a very optimistic three at this point…but I know it’ll go up once I’ve seen all the RG3 goodies included. Just an observation, I think the checklists for the All-Star Rookies, and the All-Pro Team may be flip flopped. The All-Star Rookies “ASR” are listed under the All-Pro Team. And the All-Pro Team “APT” are listed under the All-Star Rookies. Thanks for all your hard work Ryan!! Topps has always been the best card company and this years design was a little confusing at first but I like the design and I can’t wait to buy some this year. I love the variety of insert and autos, even the base are nice looking…unfortunately I get my hopes up every year and I never pull any of those AMAZING looking cards in pics….for Topps and Distributors its great…disrtibutors will open 5 – 10 cases and pull the SP autos and jerseys .and sell them for 400.00 and up…personally im not interested ill wait for chrome.. Looking forward to its release. Do we know when the finalized checklists will be available? Final checklists aren’t normally available until just before the release date. Ryan � It looks like it was recently pushed back a couple of to Aug. 21.
is there any info yet on what there online code thing will be from this years football? steve � Haven’t heard anything yet. This week is going to be a great week for football cards, I’m getting a jumbo of topps and a box or 2 or panini Rookies & Stars! Is that checklist the official and final checklist? Shockwave22 (Justin) � This is the checklist provided by Topps. There may be some unannounced surprises but we won’t know that for a few days as people start opening it. I looked at my Walmart today an they didnt even have them. Hey, does anybody know whether or not you can pull a hit, meaning an auto or a relic out of hanger or blaster box, I’ve seen a few collectors rip open blasters and not getting anything decent. It may be a little too early to tell or that it’s just rotten luck but I’d like to know before purchasing one, thanks. Card Collector 96 � From what I’ve seen, the blasters only have the Ribbon Relics as far as hits go. Not sure on hanger boxes. Hanger boxes have autographs but they’re VERY tough to hit. I like the overall look and theme of the product. lots of rookie autos. any update on the truly legendary autographs checklist? there seem to be some popping up #/20 and 30.
eric m. � I checked it out and it appears that Topps just tweaked the print runs across the whole Truly Legendary set. It is now updated. 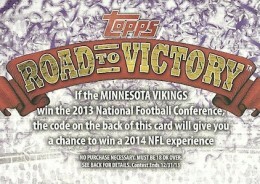 Topps always does a great job with marketing their products. 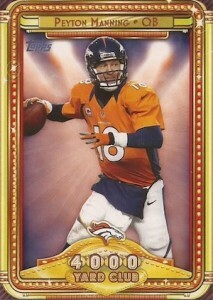 Although the basic 2013 Topps cards are out now, it’s the Chrome cards that draw the majority of collectors. As I opened up packs, the base cards have a different design on the bottom yet looks somewhat similar to last years base design. It’s truly the inserts that draw attention to the set. 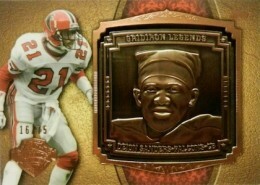 My favorite is the “Gridiron Legend”! 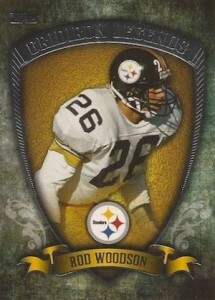 This series of inserts have a background similar to Inception and Valor except the players. The players are depicted like the base cards. It actually looks better than the other two sets mentioned above. 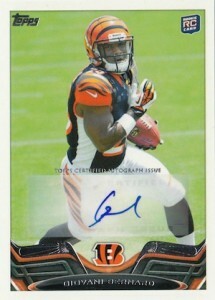 Once again Topps has met and exceeded collectors expectations. 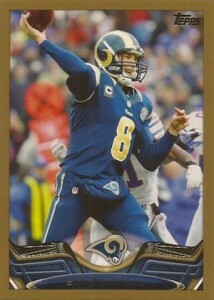 Now it’s Topps Chrome that will take the next step and elevate the standards of the card collectors expectations. I have just noticed. 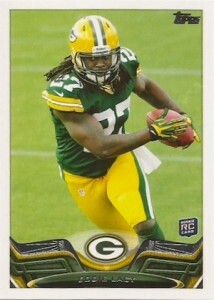 One of my cards with David Wilson has him doing one of those “MATRIX” style flips. A few months ago when 2013 Panini Score had debut, they had a David Wilson as well performing the “MATRIX” style flips. It’s very interesting how marketing of two completely different companies handle their products. 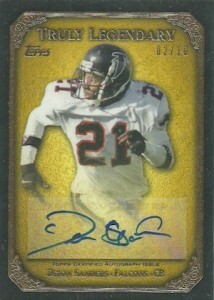 Just pulled a redemption for a Gold Parallel Gridiron Legends Comm. Ring. How good was this and how much are they going for??? I just noticed on the promo card for the “Build Your Legacy Challenge” that on the bottom of the card it says “All rookie card parallels cannot be obtained at same retailer.” That means that if you only buy cards at Walmart, you will never obtain a complete set. 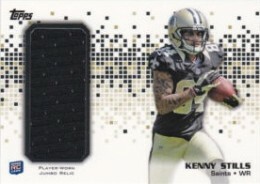 According to their website: “Certain Build Your Legacy Parallels are only available in 2013 Topps Football cards sold at certain types of retailers.” Also, beware buying these cards on eBay, many sellers are trying to pass the advertisement cards off as the actual card you need for the set. I think this is an excellent value for the dollar. I see that there is serial numbers for the 1959 and 1965 Autos but I haven’t seen any numbers on the ones I’ve pulled so far. The 1986 set is the only one I’ve seen with numbers on. does anyone know what card 75 is from the 1959 mini inserts? it seems to be missing from the checklist and im working on the base + inserts. emeekins � Looks like it was slated for Aaron Hernandez. Although pulled, a couple appear to have popped up on eBay. althought it adds to the chase that’s very unfortunate. id rather crap my pants than pay big money for an aaron hernandez card to complete my set. 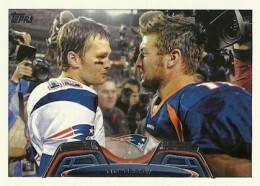 BRAVO TOPPS, IT’S ABOUT TIME !!! Anyone else notice that most all of the insert cards have white corners and are not really in good shape while all the other cards in the pack are fine.. I have bought packs from wal-mart, target and hobby shops..
Haven’t noticed that at all. ive broken 4 jumbo boxes; only issue I had was two of the parallels I pulled had edge problems. they were from the same side of the same box so I assume the they took a hit during transport. would like to see topps correct mistakes that have been made. mistakes like skipping numbers on certain sets , putting the right number instead skipping it. Great Photos and overall a great insert set collection! I did pull a 2013 Topps FB Gridiron Legends Commemorative Ring – Bronze Parallel REDEMPTION from a Rack Pack I bought at Walgreens of all places! lol. My question is this, The Redemption Card says nothing of which player I will receive. Does anyone know or have an educated guess as to who it might be? Thanks! In reference to my post earlier today as to which player I would receive when I redeem the Legends Ring Bronze Redemption Card. 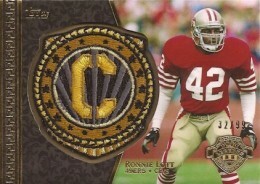 I’ve checked out eBay and compared the checklist of the Legends Ring Insert Set and found EVERY player (ALL 29) on it! So now I am VERY curious as to who the redemption is for! Any thoughts everyone??? any news on what that redemption is for? does it even exist? Pulled a Clay Mathews All-Pro(#/99)and a Jordan Reed 1986 Rookie Auto(#/140)along with several other serial #’d base cards from a regular retail box. Very satisfied with purchase and would recommend. Not sure if this has been brought up. 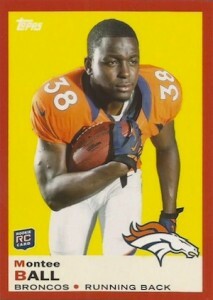 Card number 373, which is Aaron Hernandez in your list, was replaced with Brian Banks. Gary Emmert � It looks like Banks replaced him in the Mini set but not the main release. Maybe the factory set as well? there are also ORANGE Parallel cards /82 that can only be obtained from factory sets. 5 per factory set.